Shake it up!! Its Taylored Expressions release day! Hope you have enjoyed all the three days of sneak peeks using the October release products from Taylored Expressions. Well, today is the release day! Hope you have a list and ready to shop. I bet most of the new products are going to fly off the shelf! I have couple of products to share with your today. First up is a gift bag. I made this gift bag using Taylored Expressions envelope. TE has a set of envelopes at their store. The colours match their cardstocks. The envelope pack has two of each colours and is a pack of 20 envelopes. The envelopes are gorgeous, thick and very good quality. I love them. The store also stocks kraft, cream and white envelopes. Anyway, I sealed the envelope, scored about a quarter inch on three sides and trimmed off the fourth side. I used the stitched oval die to die cut the handle on the bag. I then opened the bag, creased the score lines to make a bag. I adhered the pointy corner on the bottom with strong adhesives. I glued down couple of reinforcement strips of cardstock in Cherry Pop colour inside and on the bottom so the bag can stand. For the handle, I die cut two stitched oval die from Stitched Oval Stacklets die set to die cut four oval frames out of Oreo cardstock. I adhered them on each side and both sides inside of the bag as well. To decorate the bag, I used the light die from Skinny Mini Borders Holiday die set. I first sponged Mustard Seed and Fossilized Amber on a Sugar Cube cardstock. Then used the die to die cut ten light border dies. I adhered them on the bag using Multi Medium Matt and brush Wink of Stella clear shimmer on them. To add a bigger tag element on the bag and make it more Christmassy, I made a shaker snowman using the new Snowman Shaker die set. 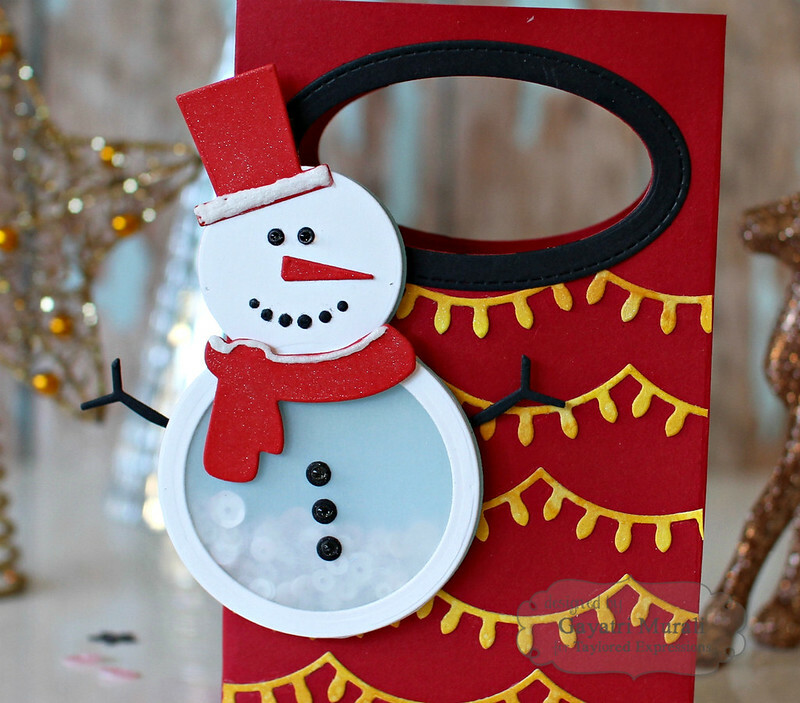 This die set is super cute and is designed to make shaker snowman. 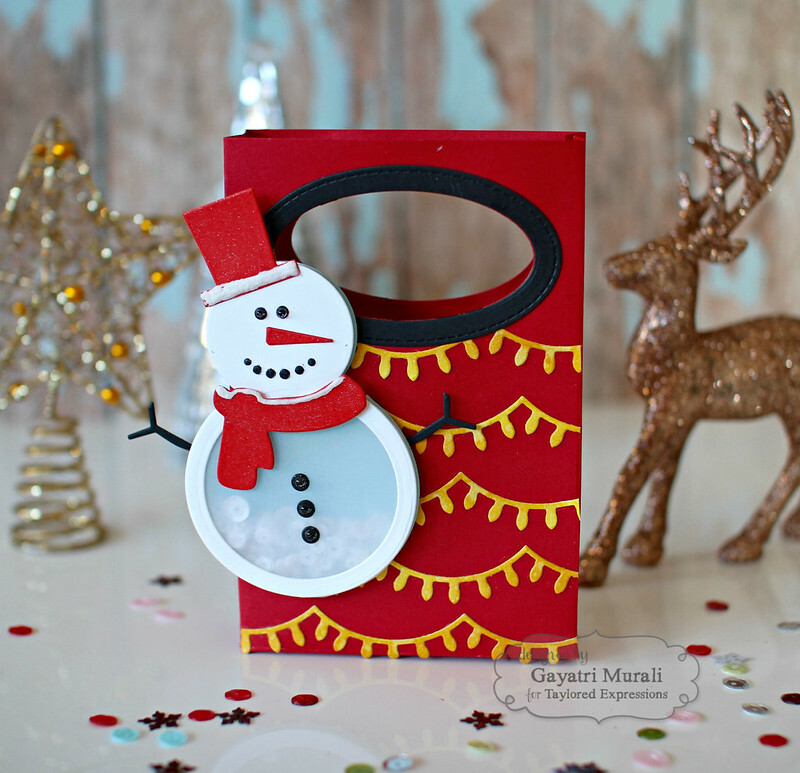 I used Sugar Cube, Cherry Pop and Spinkles cardstock to make the shaker snowman. Instead of acetate, I used vellum and filled the shaker box with new sequins Flurries. I brushed the hat and scarf with Wink of Stella clear shimmer, applied Liquid Applique on the hat and scarf as well and added glossy accents to the buttons and eyes. This bag is perfect to add some cookies or smaller gifts for advent calendar. All the supplies used to make this gift bag is listed below. The second project I am sharing with you today is a card. On this card, I used elf Grumplings stamp and die combo along with the gorgeous Woodgrain background stamp and the snowflakes border die from Skinny Mini Borders Holidays die set. I white heat embossed the Elf Grumpling and the gifts, watercoloured using Zig clean brush pens and die cut using the dies. On a Toffee card panel, I used Sugar cube ink and stamped the woodgrain background stamp. I did not want the woodgrain to be stark white. So I sponged some Toffee ink to tone it down. I added a white panel on the bottom of the woodgrain panel, adhered the Elf and the gifts using foam adhesives and glue. Then stamped the sentiment also from the same stamp set. To frame the white focal panel, I die cut two snowflakes border dies from the Skinny Mini Borders Holidays using silver glitter paper and adhered them. I then added some green rhinestones to each of the snowflakes. All the supplies I have used to make this card is listed below. Hope you like all the projects today. All the October new release from Taylored Expressions are now available for purchase from the TE store. Wonderful projects today Gayatri! I LOVE your gift bag – it's so pretty!